As usual you can leave your suggestions, observations and suggestions in the comments section below. Enjoy the challenge! A—n k–l with an extra bit on top ? Not even close this time! I can totally see why you suggest an avian keel though – I thought it looked just like one as well. My first thought was some sort of I*t******ae. Can I have a few more letters please? I’m pretty sure it’s not, but I wouldn’t want to say no if I’ve misunderstood! I was thinking it could be one of those, but so far I’ve been unable to find a match. Aha! No, not a Catfish. In that case, a L.F? If that’s an abbreviation of a non-scientific name, then I think you’re on the right track. Ah, an excellent find, Barbara! So, which do you think it is? Or neither? Paolo says that it is African so I will stick with your suggestion of P.an. Ah, I have just checked out P and see that still leaves 8 options. 7 species of sub-species of none of them, I’ll wait until Monday morning. I agree, but I wouldn’t have guessed it without henstridgesj and Mrs Powell’s help. It does have a turtley look – especially the lower jaw, but no. The eye sockets (if that’s what they are) appear to be on the upper side of the head and forward. So, perhaps an ambush predator, bottom-living or in shallow water? You can cheat – it’s on the Balcony! Shan’t. Won’t. Did. I’m glad I wasn’t a million miles away in terms of what it reminded me of. In a way. Nope – this has a lower jaw. It’s either South American or African. If it’s South American (which I think it is, but I could easily be wrong) nailing it to species level is easy. If it’s African it would be harder to pin down to species. About the only distinctive feature I can come up with to push me toward South America is the apparent absence of a vacuity on the anterior lateral portion of the frontal, but that might the angle – or perhaps it varies with ontogeny. My first impression was “Dunkleosteus” too, and I guess it’s no wonder that some early workers thought that the Arthrodires were allied with this group. Is it an amphibian? 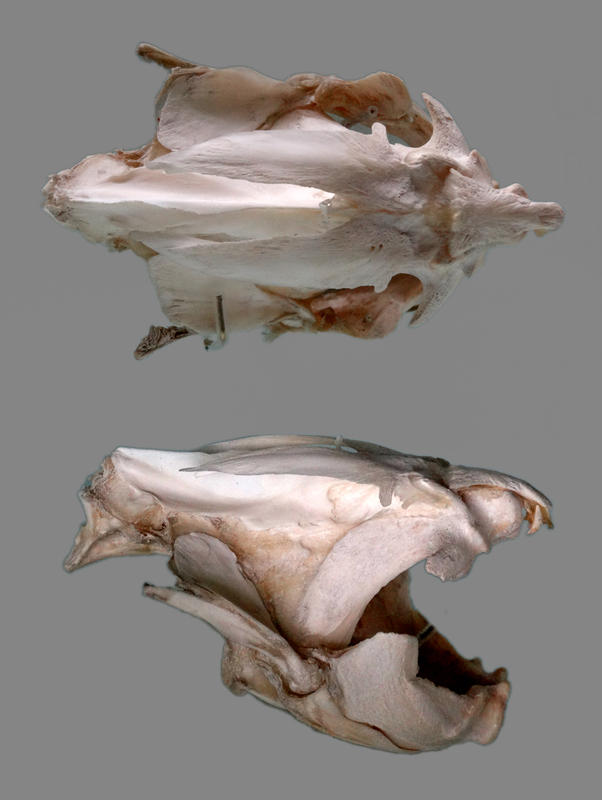 it also looks like a fish head from the side but the eye sockets on the top are a bit far apart and what looks like a nose bone. I think its a turtle skull!